3 planets and a comet before breakfast! I had to take the day off on Wednesday to do the school run while my wife went to London. It was clear at 0530 when she got up so I decided to get up too and set up the telescope. It was a beautiful morning. The air was so still and clear after the recent rain and storms. It was, unfortunately, only a gap between a never ending run of bad weather. 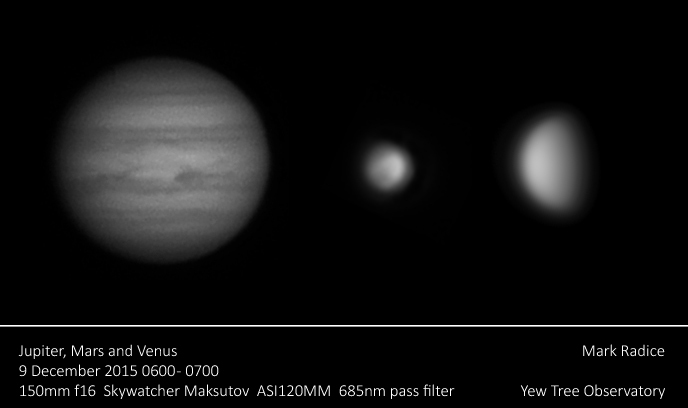 Here are the views of Jupiter, Venus and Mars. Jupiter’s north equatorial belt is very disturbed with a large bay and several festoons and knots while the southern equatorial belt is split by a white rift. Mars is showing some detail features (if you squint!). At least it can only get better as Mars gets closer (and bigger) over coming months. Venus is starting to shrink as she goes round the sun but, with a thick atmosphere of carbon dioxide and sulphuric acid, we only get to see the cloud tops. My friend, Garry Keenor had given the heads up for comet Catalina. A faint smudge in the binos conveniently next to brilliant Venus. So that’s 3 planets and 1 comet before breakfast! PS The picture says f16 but that should read f24 as I was using the x2 barlow and not the ~1.5x.